With an annual production of only 3,000 cases, Richard’s Reserve Club membership is the best way to ensure that you will receive these limited-production Amapola Creek wines and benefits. Membership is limited to 300. Receive four shipments per year (February, May, September, and November). Choose a 3-bottle or 6-bottle selection with special club pricing. Cost of each shipment varies, but averaging about $170 (3 bottles) and $340 (6 bottles) over the course of four annual shipments. Ground shipping is included in the cost of each shipment. Reorder any wines within 30 days of the club shipment, and shipping is included. Complimentary annual private tasting for up to four guests ($160 value). You pay no fee to join, and you may cancel any time after you receive your first shipment. Simply choose a club option above and fill out the form. We will take care of the rest. We will send you a mixed selection of wine to your home or office four times per year. Belonging to Richard’s Reserve Club guarantees you will receive a selection of these artisan wines. Regardless of which club option you choose, the cost of each shipment will reflect your preferred membership price and includes the price of shipping. The amount will be charged to your Visa, MasterCard, or American Express card at the time of shipment. Circa early 1990’s Winemaker Richard Arrowood was offered a small lot of Viognier from friend and grower Saralee Kunde. It was a handshake deal with the caveat that if Richard liked the resulting wine, Saralee would plant and sell him all the future Rhône varietals he wanted. 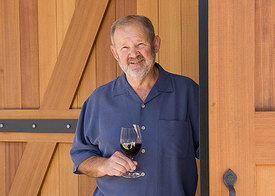 A couple of years later Richard released his first Saralee’s Vineyard Syrah. This marked the start of a love affair that continues today of all things Rhône. The upcoming April shipment features two Amapola Creek red Rhône-style wines from our Estate Vineyard in the Moon Mountain District Sonoma County in of Sonoma Valley. The featured selection showcases wines of youth, whimsy, fruit, and assertive tannins with a long finish – which are drinkable now of course, but perfect for laying down in your cellar. RRC members will receive a detailed email confirming the specifics of thier shipment and account prior to shipping.